There’s an essential rule about sharing the road with snowplows: NEVER pass them on the right. In 2016, there were 11 collisions between cars and snowplows, on one BC highway alone. That’s a lot of crashes and a lot of stress, grief and costs for a lot of people! Check out the video above, featuring VSA Highway Maintenance, our contractor responsible for the Coquihalla Highway. The reason why you don’t want to pass an operating plow on the right, is that’s right where the plow blade is. Motorists who drive along that side can be blinded by flying snow and other debris. Plows are often also equipped with extendable wings that might not be visible because of blowing snow. In addition, colliding with the snowplow – that’s there to clear the way – could impact everyone travelling the route. Plows are usually out in dangerous conditions and if other vehicles crash into them, this could take the plow out of commission. Patience is the keyword around plows. Plow operators are working as quickly and safely as they can to get the road cleared, and they pull over when they are able, to let motorists pass. 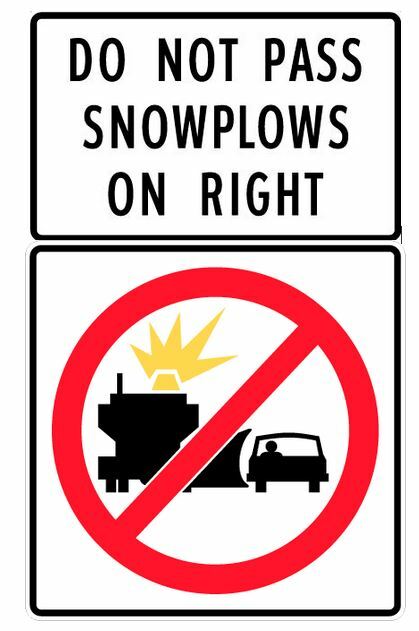 Signs posted along the road (and sometimes on highway maintenance vehicles) remind drivers that passing the plow on the right is not permitted. Failing to follow that rule can result in a minimum fine of $96 for disobeying a traffic control device (the “don’t pass the snowplow on the right” sign) as well as penalties for careless or reckless driving. 5 Responses to Is Your Impatience a Safety Concern on the Coq? “Never pass a plow on the right” can be a confusing message when approaching a plow that is working the left lane followed by a sign truck that has an arrow clearly indicating to pass on the right. For example: Feb 6 2016 approx 330pm northbound near the Coquihalla summit. Do not pass plow trucks on the right. In this situation a grader was ice blading compact snow in the fast lane which, in some locations, requires a shadow vehicle. A grader moves much slower than a plow truck so does not spray snow and ice up and into the adjacent lanes. This driver did the correct thing by first slowing down, assessing the situation and then proceeding when it was safe to do so. Hope that this helps! Yep, people are too impatient, and to be fully accurate…one should NEVER pass a plow on the highway on either side, they kick up a lot of mess in their wake. People need to learn to slow down when around these machines and enjoy the freshly plowed and in most cases, freshly sanded surface that they are getting traction on rather than rush to pass everything in sight. And no, I’m not a plow operator but a Prairie boy from Manitoba where we know a thing or two about flying snow. Hi Ken, Thanks for you feedback. As you know this is a big problem…and you definitely know about blowing snow from being on the Prairies. :) A few people have commented wisely that being a respectable distance behind the plow is the best place to be. The road will be clear, and if the plow or sander`s lights are flashing, they illuminate the way in blowing snow or darkness. Safe travels! Editor guy or gal, I’ve been on the Coq in such severe weather witnessing everything from passing plows to people driving way too fast for the conditions only to find them stuck further down the road. I remember one drive in winter ’99 that even had my knuckles white from Kamloops to south of the toll booth. That night I was lucky to even get to 20Kph and thankfully Semi’s were leaving excellent tracks, at some points I’d have snow picked up from my front end blow over the car. Was a nasty drive but slowing down and taking my time and driving smart I made the trip easily and safely. Too bad others can’t seem to lay off the accelerator pedal when the white stuff flies.